Let me start by saying you MUST try this recipe. Cancel your dinner plans, forget the leftovers and head to the grocery store tonight to make this South of the Border Salad. I am still thinking about how delicious it was and am counting down the minutes until I can savor the leftovers at lunch. As a single, young professional I am always looking for ways to make my lifestyle more convenient, healthier and tasty. This recipe hits all of those things. My bottle this week was a Southwest Ranch dressing. I really wanted to use a jalapeño Ranch (like the recipe called for), but could not find it at my local grocery store, but the Southwest Ranch dressing was a great alternate. Using a premade sauce or salad dressing guarantees an appealing flavor and using these products has made me look good in the kitchen. As soon as I saw the recipe I knew I wanted to put my own spin on it. Over the past few weeks I’ve felt more confident and empowered in the kitchen and don’t feel like I have to follow recipes to a tee. 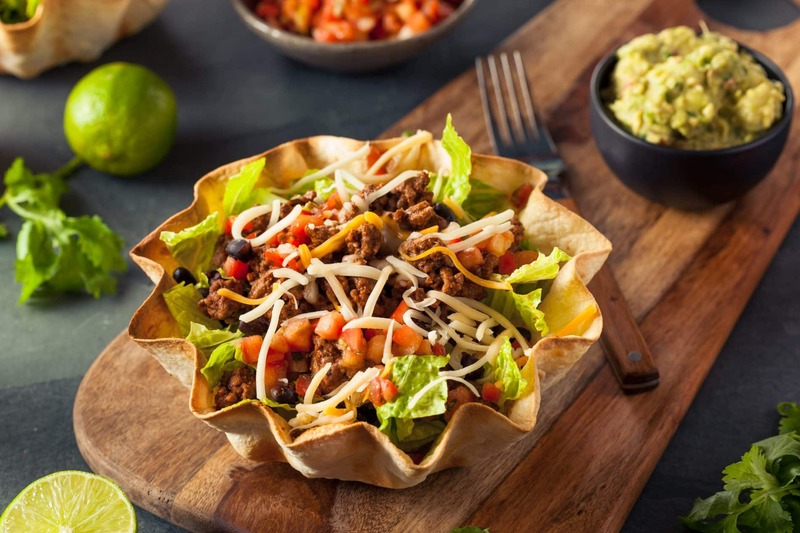 For this recipe I thought it would be interesting to create a homemade tortilla bowl, and now I only plan on enjoying salads if they are in a tortilla bowl. It was so easy to make and really added an extra special touch to the meal. All I did was drape a flour tortilla over the oven racks and bake for 10 minutes at 350 degrees. Done. Simple. Yum. I began my journey at the grocery store which I willed myself into after a long day of work and the gym. I’m so glad I made the decision to turn in instead of going home and making something that would not be as healthy for me. The ingredients were simple and I opted for ground turkey rather than ground beef and decided to forego the scallions. Guess how much my grocery bill was? Just fourteen dollars for four servings! For me that equates to three separate meals (minus the serving my boyfriend will undoubtedly devour). The prep was easy. I literally dumped the half of the ingredients that needed to be cooked into a pan and the other half of the ingredients into a bowl. Once prepared, the recipe suggested mixing all of the cooked meat, dressing and bean mixture with the lettuce, corn and cheese. Because I knew I would be saving about half for other meals, I topped the lettuce mixture with the meat (all in my fun tortilla bowl of course) and turned it into more of a traditional taco salad. Because I will be making this again, I am going to try combining everything next time. I will report back! I now feel even more inspired to continue cooking for my boyfriend and myself as these dressings and recipes are making me look like a good chef. This recipe will definitely stay in my rotation of easy and delicious weeknight meals, but I’m also looking to expand my horizons. I tend to stick with Mediterranean- and Spanish-style recipes. I’m ready to branch out and try new, challenging recipes in the kitchen. My new goal is to cook a new recipe once a week. It’s going to be challenging and I know I’m going to want to take the easy way out, but I am determined! I hope you will continue on this journey with me. What bottle should I tackle next? Maybe I’ll try something Asian or classic American. See for yourself! Brown meat in a large non-stick skillet over medium high heat, stirring frequently; drain well. Add onion, oil and taco seasoning; cook until onions are soft. Add garlic, stir 1 minute. Add beans, dressing and broth; stir gently. Bring to a simmer; reduce heat and simmer 15 minutes. Meanwhile, combine lettuce, 1-1/2 C.s of cheese, corn and scallions in a large salad bowl. Add meat mixture; toss lightly. Divide among 4 large bowls; sprinkle with remaining cheese.